Baldwin State Bank began serving the community of Baldwin City, Kansas in 1892. Over 125 years later, we still take the same approach to customer service. Our customers are our friends and neighbors – you’re never just a number. We are your hometown bank, and we truly enjoy investing in our community. We are continually making efforts to give our customers a better banking experience. We have a strong history and a strong plan for the future. At Baldwin State Bank, we never lose sight of our vision to provide not just the products and service you need, but the personal attention you deserve. We are proud to serve all of Baldwin City and the surrounding areas. We have two locations in Baldwin City, plus a ATM at Baker University’s Harter Union. Our main branch is located downtown, and is full service. We also have a second branch located inside the Baldwin City Market grocery store with extended morning and evening hours for your convenience. Baldwin State Bank is proud to be a member of our local Chamber of Commerce. 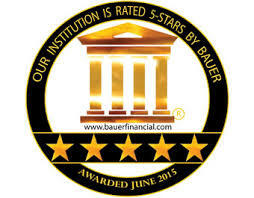 We have also been recognized as a Safe & Sound® bank by Bankrate.com, and a 5-Star rated bank by Bauer Financial.